Today in Masonic History Alphonso Taft passes away in 1891. Alphonso Taft is an American politician. Taft was born in Townsend, Vermont on November 5th, 1810. The family was considered of substance and education, however they were not considered wealthy. Until the age of 16 Taft attended local schools. At 16 he began teaching school to earn money. 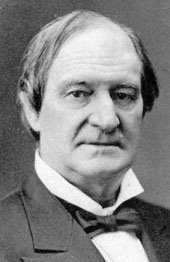 In 1829, Taft entered Yale College. He would graduate in 1833. During his time at Yale he would become one of the two founding members of the Skull and Bones in 1832. After graduating Taft would teach school in Connecticut. He would also enter Yale Law School and in 1838 would be admitted to the bar in Connecticut. Taft had no interest in staying in New England. In a letter dated in 1837 to his father, Taft would state that Vermont was a "noble state to emigrate from." He also had no interest in practicing law in New York, feeling that people there were under the influence of wealth and corruption. In 1839, Taft would move to Cincinnati, Ohio. In Cincinnati he would become involved in local politics. He would marry twice. The second marriage would occur when his first wife passed away in 1851. In 1856, Taft would be a delegate to the Republican National Convention. He would also run, unsuccessfully, for the United States House of Representatives. Taft did not serve in the Army during the Civil War. In 1866, Taft would be appointed as a judge for the Superior Court of Cincinnati serving until 1872. In 1869 a case that came before the superior court was Board of Education of Cincinnati vs. Minor. In the case Taft felt that the School Board of Cincinnati had overstepped their bounds by continuing to have the Holy Bible read in Public Schools. The case would go on to the Ohio Supreme Court. Taft would give his argument against the ruling of the Superior Court of Cincinnati. Taft argued that to suggest that the Bill of Rights only reflects Protestant values was inappropriate as religious liberty was give to all religious denominations and Christianity “is not to be regarded as sectarian under our constitution." His argument was successful and the Ohio Supreme Court sided with Taft. In 1875, Taft ran, again unsuccessfully, for the office of the Governor of Ohio. He would run one other time for the office. Many feel that his efforts in the case of the Board of Education of Cincinnati vs. Minor caused a hit to his popularity in the state. Although among his peers he was applauded for his efforts. In March of 1876, President Ulysses S. Grant appointed Taft as Secretary of War. Just under three months later Taft would be appointed as United States Attorney General. In October of 1876, after the highly contested Hayes-Tilden presidential election, Taft supported Grant when he used force in South Carolina and Mississippi to suppress violence against blacks in the south. Taft gave a lengthy speech in New York outlining atrocities perpetrated by Southerners against blacks in the south. To prevent a second American Civil War, Taft cosponsored a bill that was signed by Grant that resolved the disputed election by Electoral Commission. Taft would be the patriarch of a political dynasty that would stretch to the 21st Century. His son, William Howard Taft would become President of the United States. Among other offices, Taft's descendants would be Congressmen and Diplomats. Taft would pass away in California. Taft was a member of Kilwinning Lodge No. 356 in Ohio.